Go gaga for Gamma Girl Slots! This 5-reel slot game is for both high and low rollers alike, with a hi-lo bonus game to match! 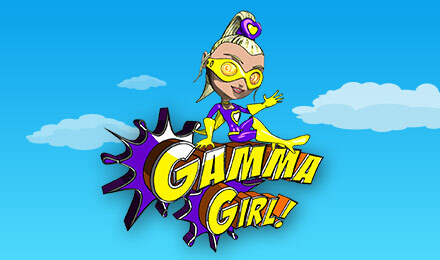 Gamma Girl Slots has an exciting superhero theme, with the cute girl icon at the heart of the game. This adventure themed slot has five reels and twenty five paylines, giving players the chance to win plenty of huge jackpot prizes. Gamma Girl is your Wild symbol who can be substituted in and there is also the chance to scoop a Word Combo bonus if you line up K-A-P-O-W across your reels. This slot machine also features two Scatter symbols. The first is the Fire and this triggers the Rescue Bonus round which is a standard Pick Me bonus where you can earn up to 100 times your triggering bet. The second is he Gamma Bonus triggered by between three and five Gamma symbols. This bonus is a Match and Win round where you pick up prizes when you reveal matching pairs on the grid. This intergalactic slot machine is a great option for slots fans who want to enjoy a range of bonus features.